American teenagers are sending more texts than ever before. 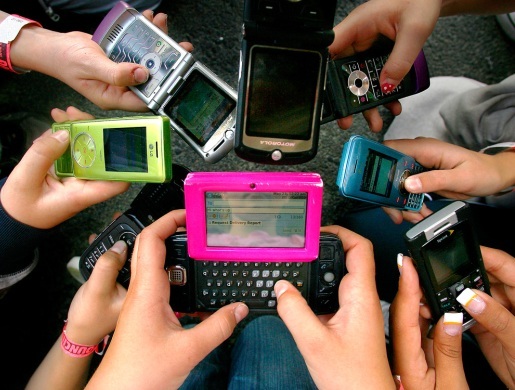 According to the Pew Research Center’s Internet and American Life Project, 75% of kids ages 12-17 have cell phones. The average kid now sends 50 texts per day, and most of them send more than that. Over half of all kids, 54 percent, say they text message on a daily basis. All this instant interaction and communication has to make kids better communicators, right? Wrong! At least according to anecdotal evidence. Nini Halkett, a history teacher at LA’s Harvard-Westlake School, says that kids these days are getting shy! “A lot of them have a harder time looking you in the eye and communicating directly with you,” she states, blaming the ease of communicating via computers and text messages and the ability to avoid direct confrontation. I’m a generation before these kids, and a late adopter of texting. However, I can see the appeal of texting and having a cell phone. It’s definitely easier to communicate with people via texts since everyone does it now. Even in places I can’t get a signal on my phone for talking purposes, like most of my house, I can still get texts out. It has maybe even made me more social, weirdly enough.